It’s that time of year again: birthday party season. Yes, kids have birthdays all year round, but somehow the numbers seem to double in spring and summer. So where is a fun place for kids to have a birthday party that’s not Chuck E. Cheese? Stockton offers a refreshing number of options where parents can feel good (and safe) about hosting the little rugrats. These places will keep the kids happy, the parents sane, and the birthdays memorable. An art birthday party is such a unique theme for kids because it gives them the opportunity to express their creativity! Shades of Color Paint offers a unique art studio experience for children of all ages. 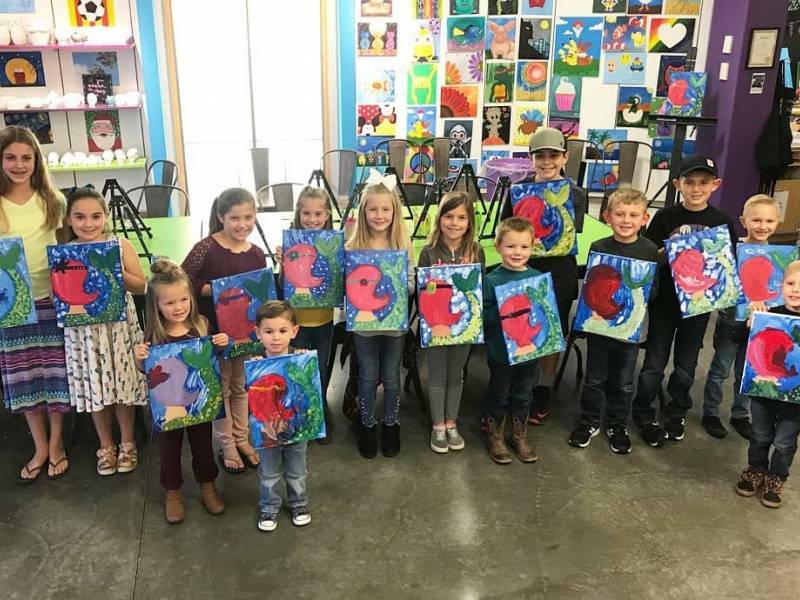 This paint studio's vision is to contribute to an environment where kids can come together to paint, laugh, and create memories. Located in Stone Creek Village Shopping Center, this studio offers paint on canvas, glass, ceramics, and wood classes and paint parties. As a parent, you get to relax while the studio take care of the creative fun for the kids! Every participant will enjoy their artistic creativity, and your party will be remembered with each unique artwork that is taken home by every single party attendee. Prices and availability vary, so make your call quick! (209) 594 0198 to book your party! Don’t be intimidated by the name: this place isn’t just for the all-star tots; it’s for any child who wants to have fun and be active. GymStars even has add-ons that include an inflatable obstacle course with slide. All activities are carefully supervised by the party coaches, and when the time comes for serving pizza and cutting cake, the coaches are ready to help. Open Monday through Friday 9am to 8:30pm, Saturday 9am to 7pm, and Sunday 9am to 6pm. (209) 957-1919 to book your party! Offering a variety of activities for most age groups, the Stockton Indoor Sports Complex is a great choice for active and athletic partygoers to enjoy the energy of the day within the structure of a safe sports setting. There are two main birthday party packages, and both come with pizza. These packages include soda, a two-hour room rental, birthday announcements over the loudspeaker, and the birthday boy or girl’s choice of song to be played throughout the day. Another offering is the private party rental. This allows families to reserve the facility all to themselves from 4:30 p.m. to 6:30 p.m. on Saturdays. Another option is to rent out the roller skating rink, but party planners will need to call ahead for specific times and dates. Closed Monday through Thursday. Open Friday 7:30pm to 10pm, Saturday 1pm to 3:30pm, 7:30 to 10pm, and Sunday 1-30pm. (209) 931-8300 to book your party! How often do California kids get to ice skate? Not nearly enough. To remedy that, plan a party at the Oak Park Ice Arena! Fully equipped with an 85-by-200-foot rink and a full-service shop, kids of any age can enjoy a skate with the entire party (although younger tots with limited skating experience cannot be guaranteed access to skating aids). The facility offers party rooms on Fridays from 6 p.m. to 7:30 p.m. and 8 p.m. to 9:30 p.m., and on Saturdays from 12:45 p.m. to 1:45 p.m., 2 p.m. to 3 p.m. and 3:15 p.m. to 4:15 p.m. The entire arena can also be rented out for private functions, but you must call well in advance. Don’t forget to dress warm! (209) 937-7433 to book your party! Birthday fun and education don’t always go hand-in-hand, but they do at the Children’s Museum of Stockton, which offers exciting exhibitions covering everything from farms to law enforcement - all designed to create learning opportunities that are completely fun. The little ones can play dress-up, build cars and paint portraits—just a few activities that can fulfill a child’s wishes. The museum offers a 2-hour party package that includes admission for up to 30 people maximum, special t-shirt for birthday child, decorative place settings, a gallon of punch, and optional add-ons for food. For a two-and-a-half-hour private rental of the museum, the party may contain up to 100 people for $500. Closed Monday & Tuesday. Open Wednesday through Friday 9am to 4pm, Saturday 10am to 5pm, and Sunday 12 noon to 5pm. (209) 465-4386 to book your party! Voted best birthday party venue by San Joaquin County Magazine, Zaps Zone is the place to be for older, higher-energy crowds. The laser-tag mecca boasts a state-of-the-art, two-story arena covering more than 6,200 square feet of playing area. And, besides birthdays, it can be rented out for private events. Party packages start at $125 and include one hour of laser tag. Don’t forget to add a pizza or two from Mountain Mike's Pizza located inside the facility. It would be wrong to think that Zaps Zone is just for older parties; kids 8 and under can enjoy Joe’s Jumper package, which includes one hour of inflatable jump-house fun. Closed Monday & Tuesday. Open Wednesday & Thursday from 4pm to 9pm, Friday 4pm to 10pm, Saturday 10am to 10pm, and Sunday 11am to 7pm. (209) 478-9277 to book your party! Since 1954, this outdoor playland has attracted more than one million visitors from all 50 states to its fairytale wonderland of adventure for the young in age and the young at heart. With an assembly of trains, boats and vintage carousels for the kids to ride—and multiple playgrounds peppered throughout the park—Pixie Woods keeps the children active and smiling throughout the day. Private rooms can accommodate up to 24 guests and are available in two-hour increments with a $50 reservation fee. Don’t forget to bring the swimsuits (and the sunscreen!) or a change of clothes and towels so the kids can run around and cool off in the water feature play area. Weather permitting, the children's park is open May through October, timings vary from 12 noon to 5pm depending on the season. (209) 937-8206 to book your party. Located in Sherwood Mall, all ages can enjoy bouncing through the air indoors on trampolines—twirling, spinning, flipping, or just jumping high at Sky Zone Trampoline Park. You may even want to try to dunk a ball into the basket as you jump. Sky Zone features a foam zone where visitors can launch themselves from a trampoline into a big pit of foam blocks. There also are party rooms and a snack bar. The trampoline park offers four lively party packages that include a special Sky Zone shirt for the birthday child, personalized email invitations, unlimited fruit punch, and more! Open Monday through Thursday 12 noon to 8pm, Friday 12 noon to 10pm, Saturday 10am to 10pm, and Sunday 10am to 8pm. (209) 888-0900 to your book your party! And yes, if there’s no avoiding it, Stockton, California does have a Chuck E. Cheese! There’s plenty more family fun to be had in Stockton; click here for more ideas. You can message us 7 days a week for assistance on shopping, dining, and things to do in Stockton.